The head of Turkey’s Directorate of Religious Affairs (Diyanet) on Jan. 31 slammed controversial TV personality and creationist Adnan Oktar, whose colorful TV shows blend religious talk with elaborately made up and surgically enhanced guests. 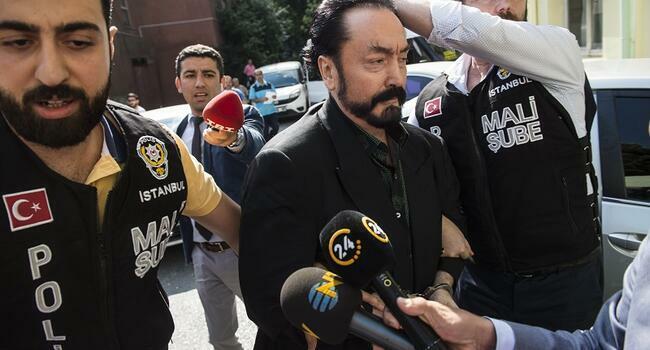 Turkish police launched an operation on July 11 to detain 234 people associated with author and televangelist Adnan Oktar over accusations including forming a criminal gang, fraud and sexual abuse, Istanbul police headquarters said. It said in a statement the raids were carried out by its financial crimes section in an operation state-run Anadolu Agency described as having been spread across five provinces and that searches of properties were continuing. Police launched one raid in the early hours on Oktar's house at Çengelköy on the Asian side of Istanbul and detained him and his guards. Oktar's guards briefly resisted the police, Hürriyet correspondents reported from the scene, adding that security forces seized an arms cache, as well as body armours and armored vehicles at the televangelist's residence. In February, Turkey's television watchdog suspended a television programme hosted by Oktar that blended theological discussion and dancing, saying it violated gender equality and women's rights. Oktar hosts talk show programmes on his television channel, A9, on which he has discussed Islamic values and sometimes danced with young women he calls "kittens" and sang with young men, his "lions". In 2006, Oktar wrote the Atlas of Creation under his pen-name Harun Yahya, arguing that Darwin's theory of evolution is at the root of global terrorism. He has written more than 300 books, translated into 73 languages, his channel says on its website.